Jack: Jack Butala with Jill DeWit. Jack: Welcome to our show today. 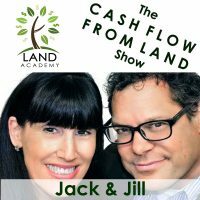 In this episode Jill and I talk about ROI, Return On Investment, expectations in the land business. Before we get in to it, let’s take a question posted by one of our members on the landinvestors.com online community. It’s free. Jack: Oh I can arrange that. Jill: Right. [Continues quoting Chad’s question] “At least then I would know my offers made it out there to them. Any guidance or comments are much appreciated. Thanks in advance”. Jill: Or just that need help. Well here’s the mechanics of it, and then I’ll address the psychological piece of it after that, if Jill can stay awake. The mechanics is that you send your … You get your mail merch done, probably through offers through owners, and the second that you submit it to LetterStream they either send it out that day in the mail or the next day. Now here’s the catch; the post office is a government institution so it’s very unpredictable and it’s inconsistent. And if you send mailers out to a place like Illinois it’s gonna take three times as long. If you send it out to the local county that you live in and you dropped it off at that LetterStream, put it at that post office, that local post office is gonna happen that day. So there’s a big huge variance, to directly answer your questions, three weeks is not unheard of at all. Around three weeks to four weeks is when you’re gonna start to get some real angry calls followed by a bunch of calls that are saying [inaudible 00:02:27] that’s just kinda interesting. And then about six weeks you’re gonna start getting signed offers back. If you price it right. Jack: Yeah if you send 15 letters out, I will confirm your worst fear. Jill: And you hand wrote them. Jack: Right. 1500 is what you want to send out a month. Jack: So I think that answers the mechanics piece of it. The psychological piece is, you know, what your experience is … The reason that there is a hundred thousand listeners in this show and about five hundred members, because people don’t have what you have. They don’t have … Let’s call it chutzpah on this rated G show. Jack: I’ve only had two situations, exactly two, that got back to me where people got stumped on a mailer and they called me and said, “I got stumped on a mailer. It’s been six weeks, I didn’t hear anything back”. Or, “I got one signed offer back and I didn’t wanna buy it”. In both cases it had to do with pricing. Jill: I even have those that they did ’em all wrong and they still got juice out of it. And we laugh about it. They’re like, you know, “I went way, you know, high or way low”, or something and there’s still some juice that they’ve got out of it ’cause you’ve got someone calling you back that wants to sell. Jack: Right. So, I mean, you’re not gonna send out … it’s the equivalent of … Let’s say you want to buy office buildings and you pick lower Manhattan, New York, and you send out every property and you offer them $1,500 for their office building. Alright that’s just silly. Jill: Right. Not gonna do that. Jack: You know, or you send out an offer for every 40-acre property in Nevada for $25 an acre. It’s silly. Some people do that and they wonder why it doesn’t work. So there’s a huge … If you get into our group and get in to the education that we provide, I tell you exactly how to run through the mathematical process of pricing an offer so that it works. And it has to do with existing sales. Not completed sales but what’s posted for sale, existing on the market. And then working your way down from there. Jack: Chad’s a member, I can see you here right now, I’m sure you did it right. Jack: “Sorry for the post I just bought a strip mall”. Jill: Yeah. “And my phone blew up”, you know, kind of thing. And that’s what happens and it’s really fun to watch. Jack: If you have a question or you wanna be in the show, reach out to either one of us on landinvestors.com. Today’s topic, what to expect from a return on investment standpoint when you’re a real estate investor. ROI expectations. Jill get out your nail polish. Jill: Okay, I’ll be back. Jack: This is the meat of the show. This is a direct question on our Thursday weekly call. Every Thursday Jill and I have a weekly call, a weekly webinar at zoom.com. If you go to landinvestors.com, it’s free, you just log in and you can listen [crosstalk 00:06:01]. Jill: It’s open to public for right now. It’s normally a member thing but right now it’s open. Jack: So this question came from a guy in Massachusetts, his name’s Michael and he’s extremely intelligent and he’s doing very, very, very well in this business. He’s only been doing it probably six months. In fact, like Chad he was really skeptical. He called me two weeks after his first mailer out and said, “This is ridiculous, doesn’t work”. And now he’s turning how many deals? Jill: Mm-hmm (affirmative). Oh yeah, big deals too. Jack: Right. So his question directly was, “Given the concept of the velocity of money, right, you take $1,000 and if you can turn it 50 times a minute, it’s way better than buying a piece of property for $5,000 and selling it for $25,000 but it takes a year. Right. It’s the velocity of money so, given that, should you sell on cash? Should you sell on terms? What’s the best way to utilize the velocity of money?” What can you expect from return on investment, in other words. And I’m gonna tell you historically what happens with Jill and I, and the stuff that we work on now and why. So, about six months ago I looked at the purchase price and the sale price and I took all the fees out, posting fees and everything else and overhead expenses and fixed cost and all that. And what we purchased it for and what we sold it for, was 64%. We marked it up 64%. So if we bought it for $100, we sold it for $164 or if we bought it for $100,000 we sold it for $164,000. This is land only, this isn’t houses. That’s what you can expect if you’re doing things generally correctly. This is what we do now. We buy a ranch in, let’s say, Santa Barbara county, what we call a ‘movie star ranch’ for seven or eight hundred thousand. We sell it for, I don’t know Jill, nine hundred? Jill: Nine. That’s what I was gonna say. Jack: We make a hundred grand on it. Now it’s more about, for us, it’s about dollars not percentages, and then the person that buys it from us usually they list it and do the whole regular real estate thing and sell it for 1.6, 1.7. We always make sure that our customers are wholesale buyers that we have on an A-list, make more money than we do so they keep coming back. Jack: We don’t put any money in. Jack: Not even a dollar. We have money partners for that, for those kinds of deals, so what’s your ROI on zero? Jack: On zero investment? It’s pretty darn high. You can’t calculate it, it’s so high. So ROI is really important. Let’s look at some other industries in 30 seconds and, like, what does Walmart make? Less than 3%. Grocery stores, 1%. A good manufacturing facility will make, that’s doing everything right, will maybe make 20%. Maybe. Jill: What’s Costco? ‘Cause I know you looked it up. Jill: It’s the membership fees. Jack: It’s the membership fees, the annual membership fees where they make money. I don’t know what the margins are on that. It’d be easy to find out. So all that boils down to this. And here’s the takeaway from this episode. Forget about ROI. Let’s get back to real simple, basic stuff. Buy a piece of land, really rule acreage and double your money. Mark it up 100% and sell it as fast as you can, and keep doing it. Once in a while you get some property that’s pretty high quality, sell it on terms. You buy it for $4,000, $8,000. Sell it for $20,000. $500 down, $200 a month. The ROI percentages on that when you calculate it all out exceed 4 digits. It’s about 1000% return on your initial investment, or more. Jack: Right, sometimes a day. What his ROI is, he’s gonna say, “I don’t care!” And that’s really the right answer. Jill: Exactly. He doesn’t care. Yes. Jack: People who ask about ROI have a lot of money in their pockets. “I have a thousand dollars, a hundred thousand dollars and I want to make 10% return consistently forever so I don’t have to work anymore”. And that’s fine. That’s a good question to ask in the beginning, but once you get in to the thick of actually doing it, it’s so much more than that, that it just doesn’t matter. Jack: Join us in another episode … I was thinking, “Jill is gonna say something. I can see when she’s got that … the wheels are turning in her head. She’s getting ready to say something funny”. Join us on another episode where Jack and Jill discuss how to use information, that’s me. Jill: And inspiration, that’s me. Jack: To get just about anything you want. Jill: We use it every day to stay awake and buy property for half of what it’s worth and sell it immediately. Jack: I promise you our show tomorrow will not have to do with math. You are not alone in your real estate ambition. Nice work. Jill: Thanks. Know, it was funny, I was remembering you had that chart for me that you made, you gave me an Excel file where I could plug in purchase price, sales price and I could see the ROI. And this was just kind of for fun so I could … you know you made that … Remember what I’m talking about? Jill: Oh I didn’t know that. Jack: On the middle, right side. So if you just go to the site, click on it, and then you can download it right in Excel on your own computer and plug in your own numbers. Jill: I didn’t know that was there. Jill: Cool, yeah I love it. That’s awesome.